We all know it, right? Vikings are yucky! They sing rude songs, eat like pigs and then burp loudly. Gross. Well – except for Thorfinn. He’s no mucky barbarian. He’s helpful, polite and jolly nice. (That’s him washing the dishes over there.) 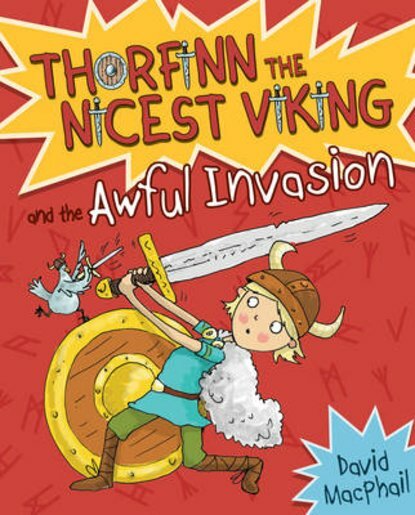 Too bad his dad is village chief Harald the Skull-Splitter: the roughest, toughest Viking of all. Harald is sick of Thornfinn’s too-nice wimpy ways. It’s time to harden him up! Now Thorfinn is stuck on a longboat to Scotland with a crew of hostile tough-nuts. Out here, manners mean nothing! How will Thorfinn survive?